In July 2019, thousands of high school aged children will gather at the U.S. Bank Satdium for the LC-MS National Youth Gathering (NYG). The NYG is a week long event filled with worship service, bible studies, break out sessions, servant events, and many more fun activities. SPY is raising funds to attend this gathering. 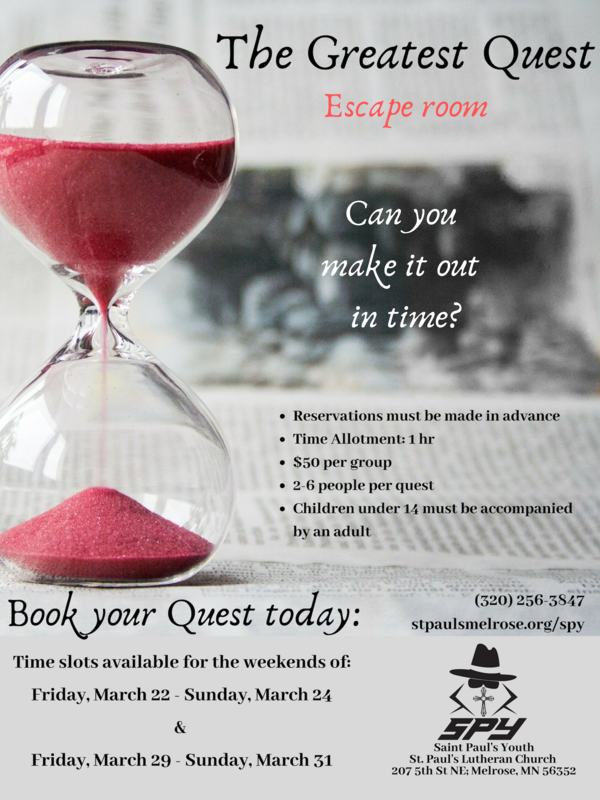 The next fundraiser is an escape room. For the uninitiated, an escape room is a giant puzzle. You and your group are put into a room and given a set amount of time to figure out a series of clues and puzzles. If you manage to solve all the puzzles in the alotted time, you win the challenge. The esacpe room will run the last two weekends in March. Please call ahead (320-256-3847) to reserve a spot. Cost is $50/group. All proceeds will go to helping the youth attend the gathering. Additional donations are greately apprecaited! Recommended group size is 4, but we allow groups of up to 6. You will need at least 2 people to complete all the puzzles. Thank you to Thrivent Financial as well as our volunteers for making the event possible. You will have one hour in the escape room. Plan on being here for an hour and half. Please call 320-256-3847 to reserve your spot!